There’ something about cooking meat on a stick over a fire that can’t be beat. Something primitive. Something manly. Something in our bones. It’s basically how cooking got started and it’s still how most of us men love to cook. And it’s what I decided I wanted to do for my last night of bacheloring it up before Mrs. G came home. I didn’t really have a plan, but some digging around in the fridge and I came up with a chicken breast (Yay! How boring), some teriyaki sauce (can’t remember the brand) and some green onions. Ok….I can make this work. With a quick slice of the knife, I had the chicken cut up into bite sized pieces and into the teriyaki sauce to marinate for a few hours. Place some skewers into some water to soak while I wait. Now its time to kick back on the couch and watch some tv. Time to do some chores and straighten up the house while the chicken does its thing. 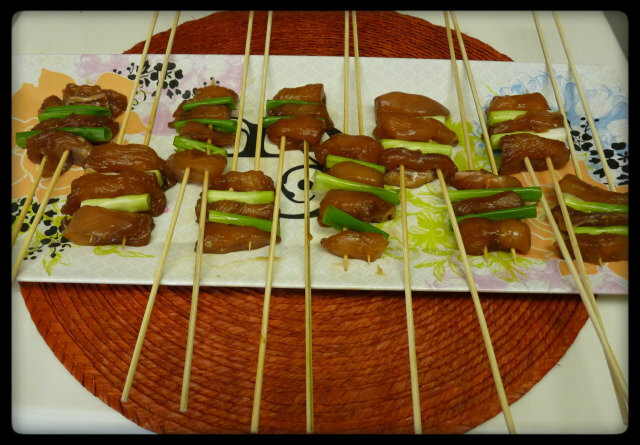 After a few hours, it was time to pull the chicken out of the marinade (discard the marinade) and begin skewering. 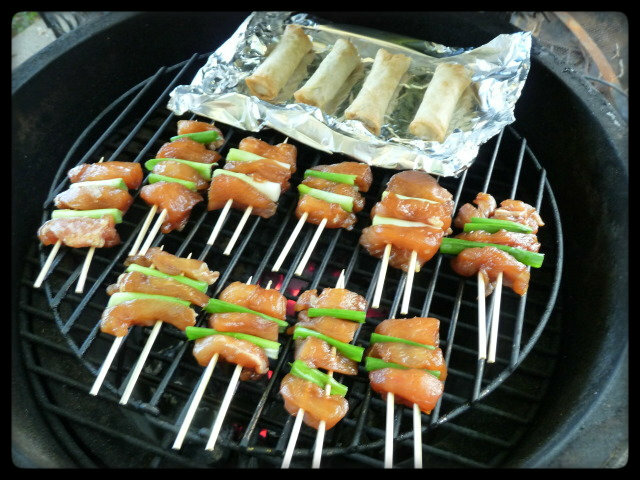 As you can see, I alternated the chicken and the green onions and used two skewers so that the chicken and onions would not try and spin when I go to rotate them on the grill. Speaking of the grill, at this point you should have it lit and pre-heated. I set mine up for 425F. Kind of a weird temperature to cook at, I know, but there was a reason. According to the box, these spring rolls were to be cooked in that metal box in the kitchen. You know, that oversize box? The one that I use to tell time on when I’m in the kitchen? I hear some people use them to cook in, but I’ve forgotten how. 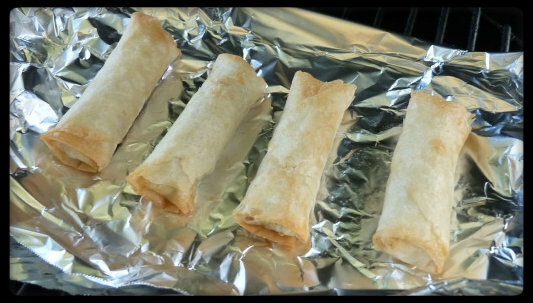 Anyway, had I not been cooking these spring rolls, I probably would have cooked my teriyaki somewhere between 350 and 400. Speaking of…time to get those suckers on the grill. Meat on stick over fire! Arr! Arr! Arr! You might have noticed that the length of the skewers magically shrunk. While I love the Egg, it isn’t the most spacious of grills as far as square footage, so the skewers got cut down to fit. Don’t really need long skewers anyway, just enough to grab with the tongs so you can flip them. I would love to tell you how long it took to cook these, but I can’t. Olie, our German Shepherd, was wanting some quality Dad time and we were playing fetch while I was sipping on a bourbon and coke. I will tell you they go fast. Less than 10 minutes, probably more like 7, but always cook to temp and not time and you’ll never have dry meat. In the case of chicken, you want to hit 165. Check on them every couple of minutes, baste them with a little bit of teriyaki sauce and flip them about halfway through. These would make a great little appetizer for a party. Something for the guests to gnaw on and keep the hungry masses at bay while you grill up the main course. Or you could serve them up as a main course, maybe with some fried rice if you feel like whipping some up (or if you have some left over in the fridge like I did). One chicken breast was enough to feed me and have enough left over to bring to lunch, but you may have to adjust the amount to feed your hordes. And feel free to substitute thighs in place of the breasts. I probably would have if I had gone shopping for this meal instead of scrounging in the fridge. Either way, you can’t go wrong with meats on sticks! Arr! Arr! Arr! How do you say “skewer”? 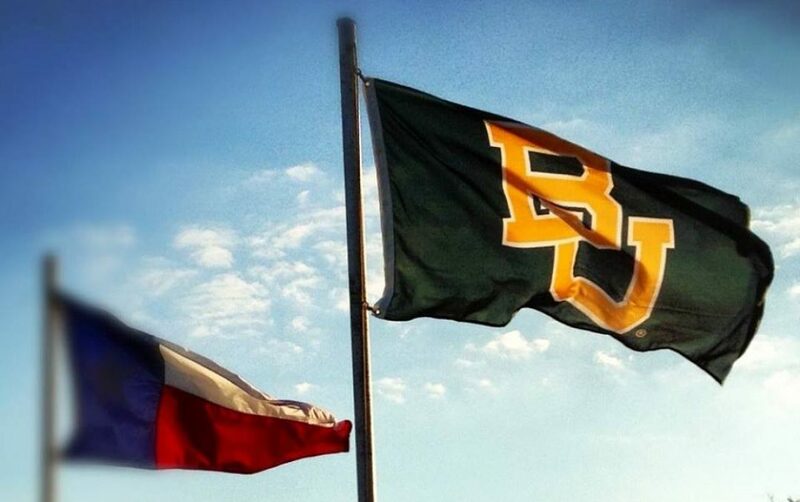 Like a Texan “skyer”? Or do you split it into two syllables? Either way, these look fabulous. And my wife loves skyers. Definitely two syllables but I think I say it Sku-wers with a long u and drawn out. Awesome. I DO wish there were more meats on sticks. How can you go wrong with meats on sticks? 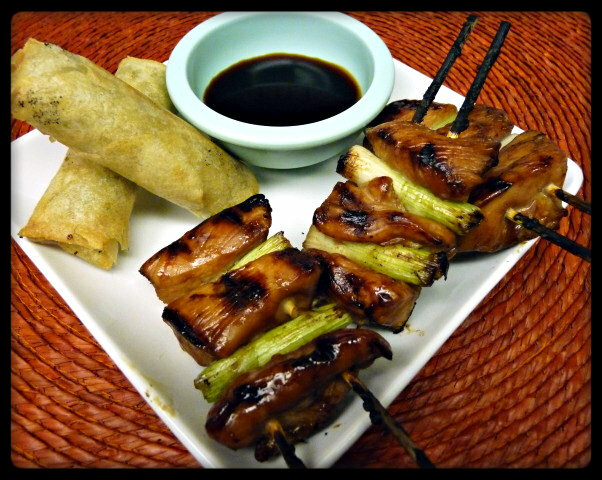 OMG, I have been craving teriyaki lately and you just reminded me and inspired me! Everything is better grilled, and on a stick – for sure! These look great. I have a little birthday party coming up soon, mainly with adults, these will be quick and easy, and taste great. Thanks for sharing, gonna give them a try. Those look really good, Griff. I keep a clean pair of garden shears in my kitchen just for snipping the bamboo skewers like that. LMAO over “time to do chores”. I wanted to let you know that I’ve nominated you for the Addictive Blog Award. Because you are totally addictive! 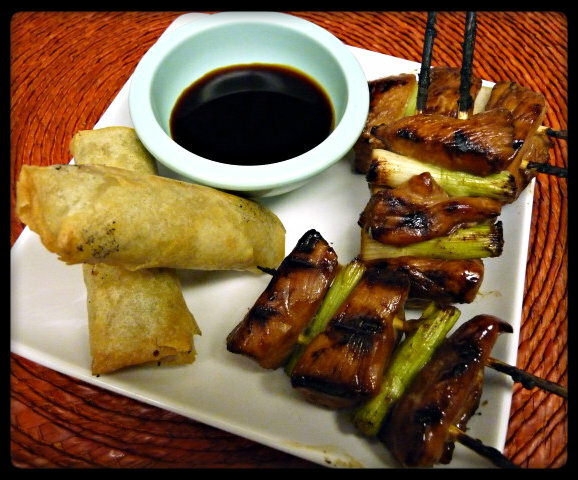 I love the idea of using two skewers on each one … kinda solves the problem of the items on a stick not staying put! And, the recipe looks yummy! 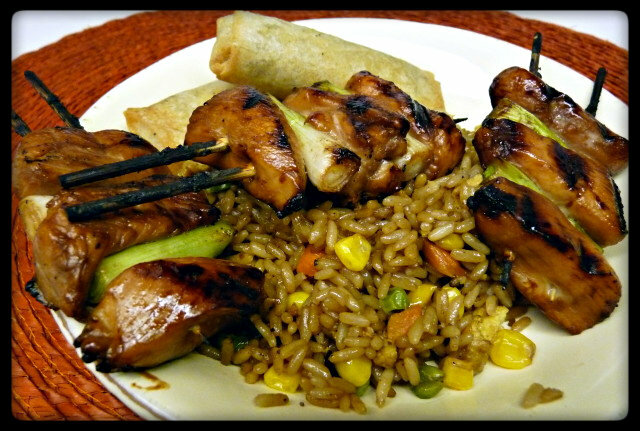 You can never go wrong with teriyaki. Those look great! Just tried this. It was so easy to do and The taste was awesome. I also made up some fried rice for the first time. Did it on the egg which made it incredibly easy.